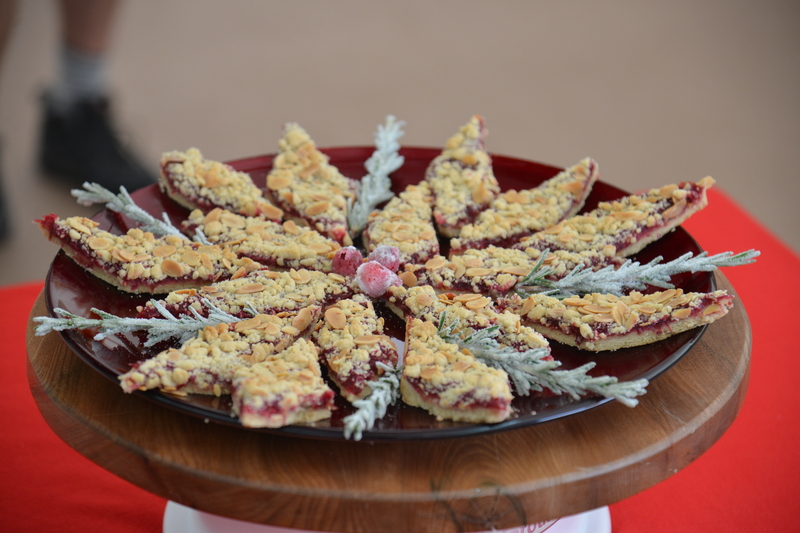 Michael Wolfe usually finds inspiration for his bakes in art galleries but during "Cookie Week" he is inspired by the holidays and incorporates a makes a cranberry jam in his signature bake. Michael's Cranberry Almond Ginger Bars recipe also includes ground and fresh ginger and is finished with a nutty crumble on top. Watch the full "Cookie Week" episode from season two episode 2 of The Great American Baking Show to see if the judges also taste the holidays when they eat his cookie bars. 1. In large saucepan, mix cranberries, sugars, ginger, zest and vanilla. Cook over med-high heat, and bring to boil. Boil until reduced and syrup is slightly thickened (about 5 min. or so). Stir frequently. Remove from heat and cool in shallow gratin dish. 1. In medium bowl, sift flour, salt, cornstarch, and ground ginger. 3. Mix on low speed. Scrape side of bowl with rubber spatula and add remaining flour. Stir by hand until remaining flour is just incorporated. 4. Press about 2/3 dough into prepared pan evenly. Place parchment over dough and continue to smooth by hand until very even. 5. Pour cranberry filling on top and smooth evenly with offset spatula. 6. Add toasted almond to remaining dough and gently mix, and then crumble evenly over cranberries, allowing some cranberries to show through. 7. Place on middle rack of oven and bake for 30 min. or until top begins to brown. Cool on wire rack and cut into desired shapes.